Arthrex orthobiologics with the aid of other Arthrex technological products and techniques allow surgeons to effectively perform cartilage procedures safely and reproducibly. Arthrex orthobiologics products are used in orthopedic therapies and play a beneficial role to help prevent infections and promote healing. 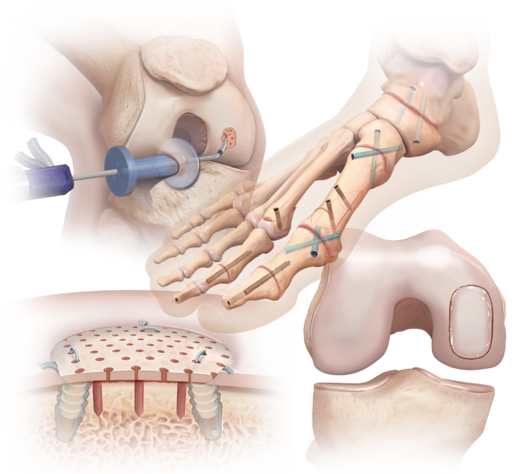 The various treatment options available to surgeons include PowerPick™ microfracture instruments, Chondral Dart™ device, headless compression screws, BioCartilage® extracellular matrix, Cartiform®* viable osteochondral allograft, BioUni® OATS® technique and Autograft OATS® technique. *Cartiform is a registered trademark of Osiris Therapeutics, Inc.